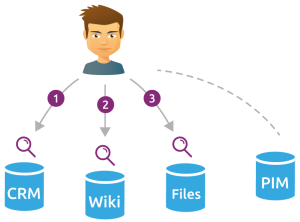 Antidot has a strong reputation for developing advanced information access technologies: semantic search, content classification, etc. – used in many high-profile projects. But as the market matures, after trials and pilot projects, enterprises better understand the use cases these technologies can solve and instead of “building blocks” that need to be assembled through lengthy projects, buyers are now looking for full-featured industrial solutions. This is why we invested heavily in a new type of software to solve the challenge of efficient and agile knowledge spreading – think proactive information, chatbots, predictive customer support, etc. This software is called CDP, or Content Delivery Platform. In this post, we are reviewing what makes a CDP different from previous approaches, and the benefits it brings. A Content Delivery Platform is a software solution that creates a repository of smart information and acts as a secure single point of delivery. makes this augmented information accessible to applications and processes in a contextual and tailored way. 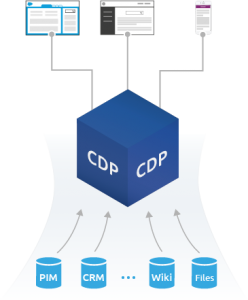 For more details of what a CDP is, see the Content Delivery Platform page. But it is also important to understand what it is not. At the risk of stating the obvious – a CDP is not an authoring environment, nor does it replace or modify any of the existing applications that generate, store and manage content. However, as these applications are usually designed for a specific purpose (CRM, helpdesk tools, Web CMS, wikis, file servers, etc. ), they are not suited for fueling other channels by adapting the content to the target end-point. 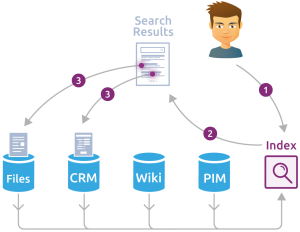 In an IT landscape made of multiple applications, users looking for information about a product would have to connect to different sources, search each one separately, and move to the next one until they find what they want, and go through all of them to make sure they are not missing any critical piece. Not knowing the existence of a source or not having proper access means invisible content and lost information. Search is inconsistent across the different sources and requires knowing each tool and adapting the search strategy. It is costly (in terms of licenses) as it requires that every user has access to each application, at least as a reader, hence complexifying the security setup. The results are in formats that are intrinsically bound to the source applications, and not tailored to other needs and situations. For example, looking for spare part references would require having access to the PIM (Product Information Management) application, knowing how to search and navigate the PIM, and the resulting info may not be easy to understand or to reuse for customer support purpose. A CDP is not a federated search engine either, and it even transcends this legacy approach. The search is federated and becomes consistent. They are still bound to the format of the document to be able to exploit the information it contains. Feeding several processes and apps with content coming from multiple sources adds another dimension to the complexity of content delivery. It creates a single access point, one place to unify all information needed to solve specific business challenges across the enterprise. It brings consistency to formats of content and to metadata. It applies security rules that are suited to varied delivery situations and to the profile of the users, controlled in a central manner. It allows dissemination through multiple channels. For more insights on the core capabilities of a Content Delivery Platform, continue reading here: Content Delivery Platform page.